I feel I should start with a minor confession – my first skiing experience was actually when I was a toddler, rather than an adult. My parents took me to the scottish ski area of Glencoe for the day and attempted to put long sticks on the feet of a very confused child. Ultimately, the experience culminated in tears and being run over by an overly enthusiastic boy in a toboggan. After this disaster, I was understandably uninterested in repeating the affair with future ski trips. Years later as an adult, my fiancé Sam took me to Austria for a few days with the intention of teaching me how to ski and convincing me that, contrary to my toddler trauma, it can actually be a fun and rewarding activity. After a couple more of these trips, I was starting to feel fairly confident with my ability and – shock, horror – to really enjoy myself. I’m not amazing, but I can tottle down blue runs without losing control completely. 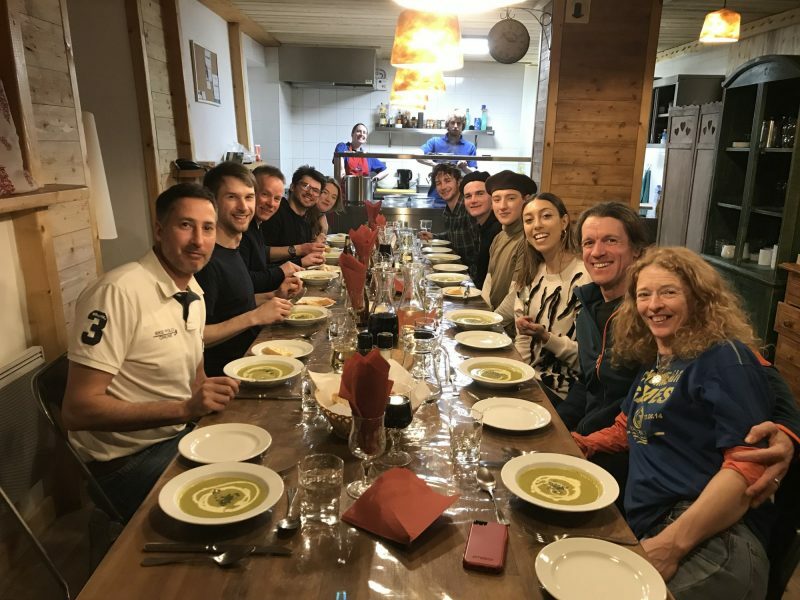 So, when the chance came to spend a week at La Plagne with SkiBeat, I was excited at having the opportunity to hone what I had already learned with a longer period of skiing. We arrived at our chalet in the middle of a mid afternoon blizzard and were greeted by our friendly SkiBeat chalet hosts, Sam and Jenna (above). 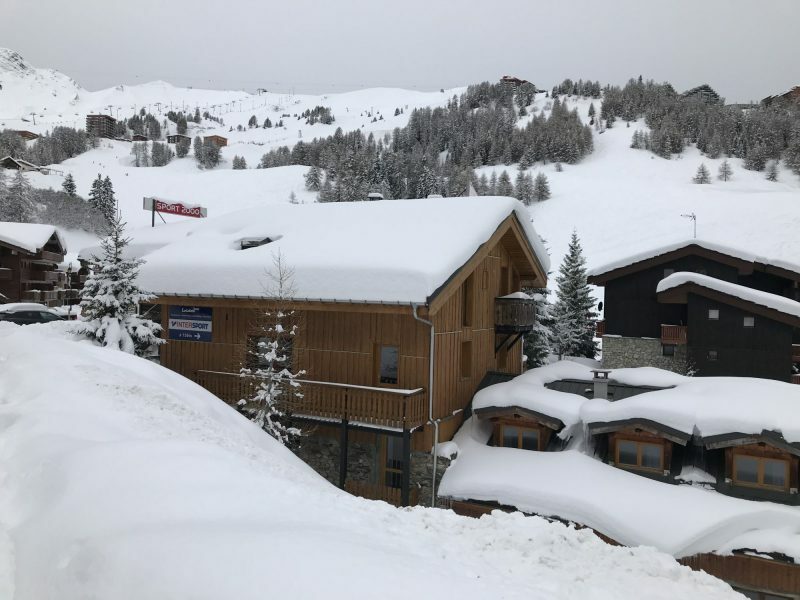 Chalet Bartavelle is exactly what I imagine when I think of a classic winter wonderland homestead – open log fire, a sauna, incredible views and everything being made of wood. Each room has its own ensuite bathroom and balcony, with plenty of storage for your cumbersome skiwear. 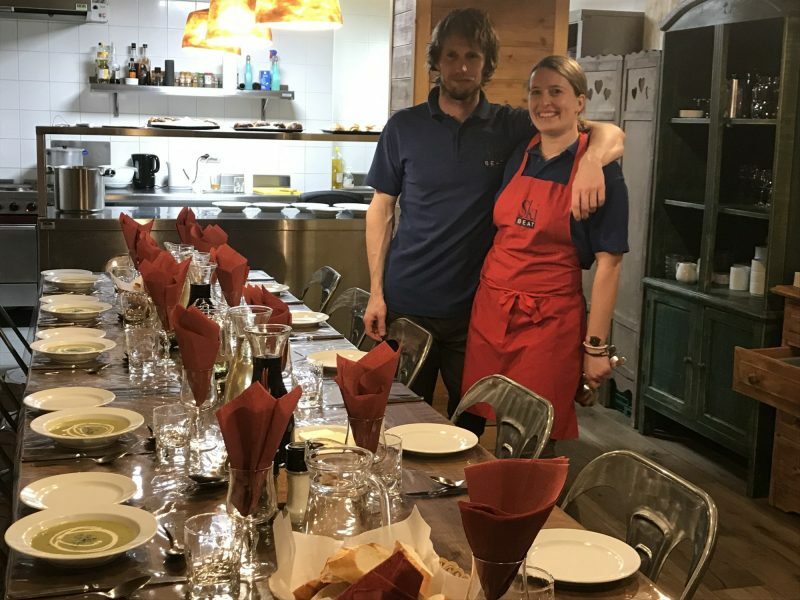 Every night bar one, we were supplied with a delicious three course meal along with a constant flow of wine and conversation with our fellow guests and our knowledgeable hosts. First thing’s first – rentals. We used the services of Skiset’s Boudu Ski Hire where we were able to try out the latest thing in ski footwear technology – a foot scanner! It reminded me of the set of scales in my bathroom, but less terrifying. On my last two ski trips, I found my boots to be too narrow for my wide feet, leading to painful arches. With this scanner, the assistant was able to give me boots that were perfectly fitted. I was able to adjust the tightness to my level of comfort without feeling too snug around my arches. After past trips of powering through with uncomfortable boots, this was a huge relief. We began our trip by going on a guided tour of the resort with Sylvain from Oxygene Ski School. He asked what our group’s skill level was, and I sheepishly admitted my vague intermediate standard, worried that this would mean the tour would have to be confined to a smaller area of the resort. Luckily, this wasn’t a problem for Sylvain who was happy to adjust the runs included in the tour to match my ability and still provide challenging sections for those with more experience. It was also made clear that if anyone was feeling tired during the tour, he was happy for them to peel off. As I had hoped, it was a much brighter and quieter day than our first, and I was able to get a proper lay of the land while enjoying the slopes. Four hours of skiing is no small feat, and with Sylvain’s help I was able to conquer a few red runs along the way. I sceptical about getting La Plagne’s Paradiski pass that includes all the lifts as well as a one off trip to Les Arcs because I was worried that my intermediate status meant that I wouldn’t be able to travel very far. 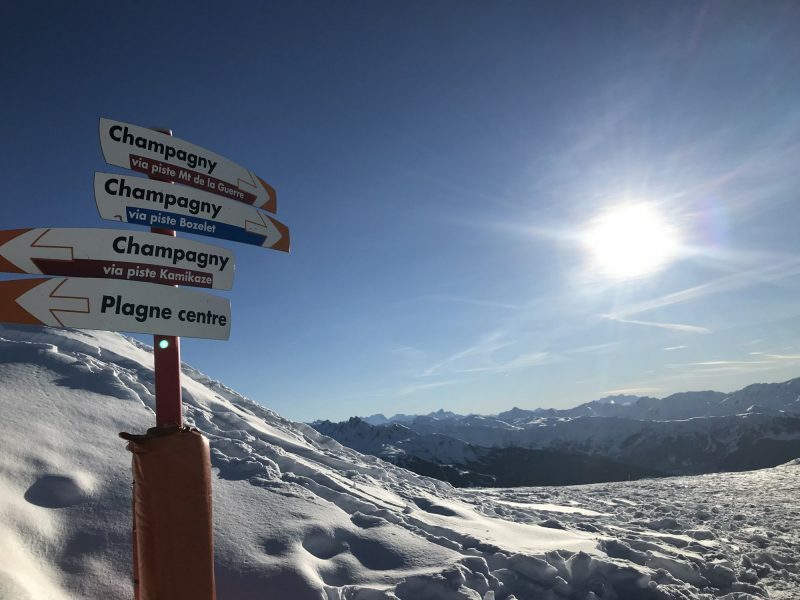 However, the vast number of blue runs and easier reds available in La Plagne meant I was able to take in the stunning surroundings atop the various mountain peaks without fear of how on earth I was going to get down. As my confidence grew in the coming days, we took our trip out to Les Arcs with the aim of getting to the highest point in the resort. 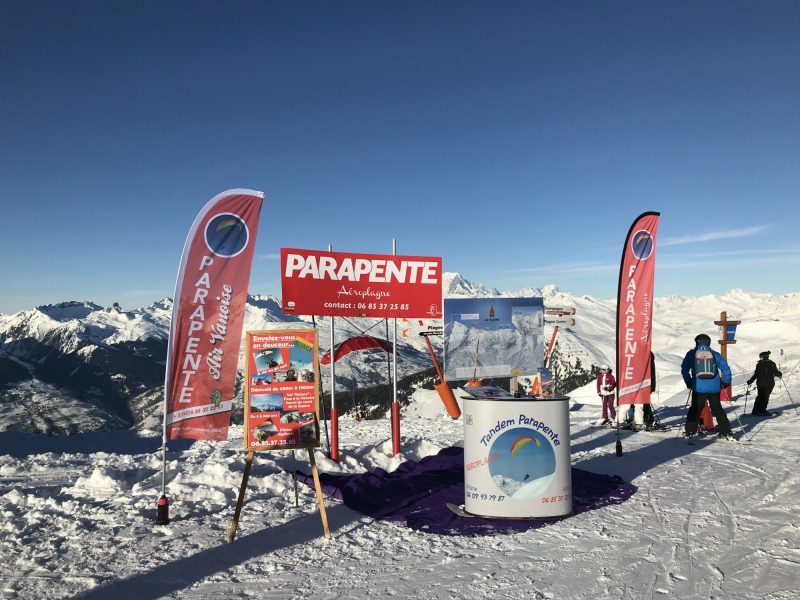 The waiting time for chairlifts and gondolas was minimal (even during French half term), and we were able to find our goal with the help of La Plagne’s app, YUGE. No need for soggy paper maps here! You can find all the information needed on your phone – the weather, lift closing times, maps and après ski activities can be looked up. Speaking of segues, there’s a plethora of exciting activities to be enjoyed after a hard day’s skiing at La Plagne. We were lucky enough to be able to try out the resort’s famous Olympic Bobsleigh Track; nothing says ‘fun’ like four adults screaming in terror while racing down an ice slide at 80kmh! The most impeding con of learning to ski when you’re older is that you’re much more likely to damage yourself or develop strain than if you learned when you were a child. On our second day, I was already starting to feel the aches and pains familiar to most experienced skiers. Fortunately, MassageMe was there to help, providing skiers with a wide range of massages to help relax those muscles and get you back out on the slopes. I can also highly recommend the resort’s SuperLuge experience (in essence tobogganing down a blue run with a guide), which I swear I was much better at than I will ever be at skiing! When I think back to that trampled, red faced child on skis, I would never have imagined her whizzing down a red confidently. Despite being nowhere near 2020 Olympics standard, I found I was able to see as much of La Plagne as anyone else. 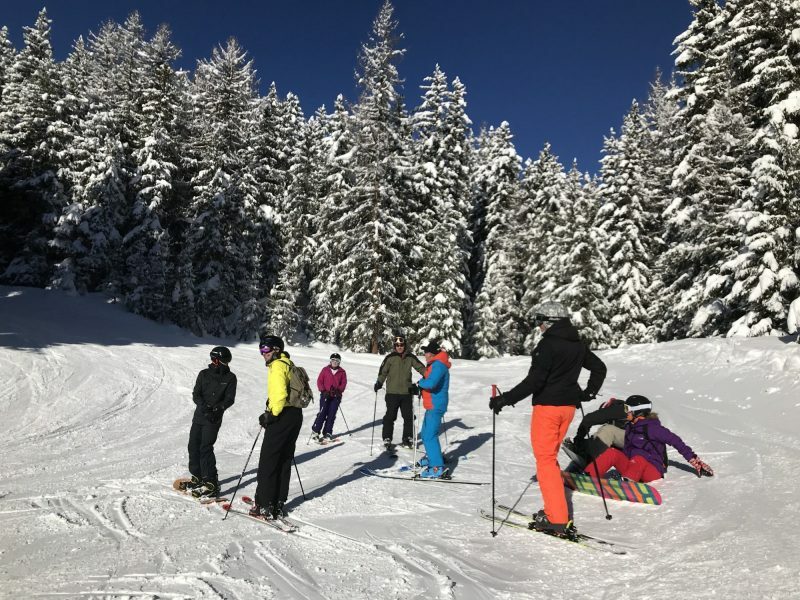 Even if I had been a complete beginner, there were so many options for easy runs all over the resort and plenty of après ski activities to keep non-skiers happy. 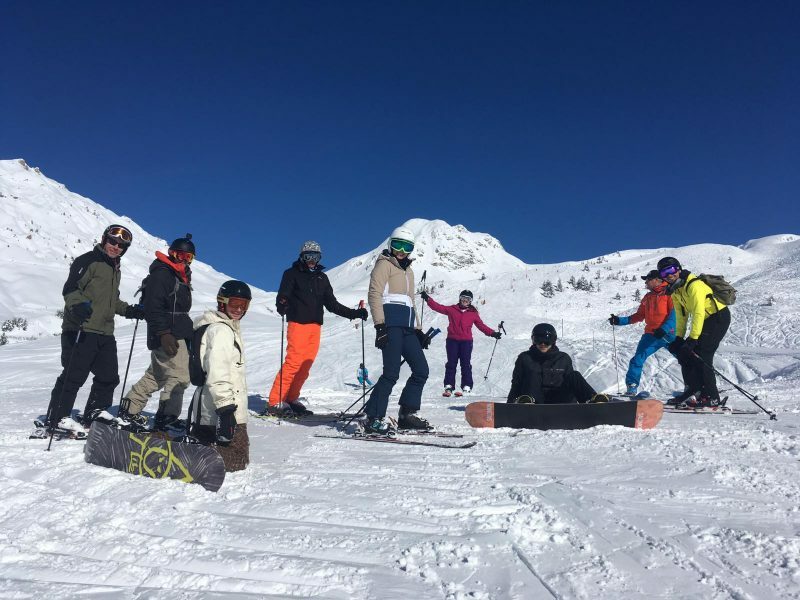 For learning or improving skiers like me, La Plagne is a perfect playground to perfect your skills. After a week of skiing, seeing incredible views and eating way too much rich food, I left feeling accomplished and relaxed. For me, La Plagne helped me improve my skiing and gave me confidence that some day soon I’ll be able to race down a black run with my fiancé in tow. Ski Beat has been organising high quality fully catered ski chalet holidays to the French Alps for over 30 years. This coming winter Ski Beat’s chalet hosts will welcome guests in over fifty chalets, in nine ski resorts.